Trebro is a Billings, MT. based manufacturer and distributor of a complete range of automatic stacking turf harvesters in small roll and slab configurations. Recently added to the Trebro Range are transportable forklifts and specialty rotary mowers. Trebro also stocks a complete range of original manufacturer parts at competitive prices. 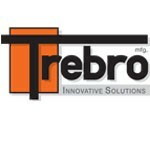 All of Trebro’s machines are backed up by their responsive after the sale service.